Gameplay continues the same basic method introduced in SSX, with the main tracks being 'remixed' from the previous games and two new tracks, Garibaldi and Alaska. The important new feature added to the series are the Uber moves. If players are able to fill their boost bar to the maximum, they will be able to perform Uber moves which involve characters taking their feet off their board and doing over the top moves. If a player successfully lands an Uber move, they are given a short amount of time for infinite boost, which can be topped off by performing more Uber moves. Each player can perform five Uber moves, including a personal move if the character is using a board that matches their style. If a player successfully performs six Uber moves, spelling out 'tricky' on the boost bar, they will have infinite boost for the remainder of the level. Practice Mode is a great place for beginners to get the opportunity to get used to snowboarding. As in Freeride, players have the ability to do what they wish, and to practice tricks. In the World Circuit mode, players have the ability to unlock characters, boards and outfits by racing and competing in events. There are two main categories of events; Race and Show-off. In race, the player must compete in the Quarter- and Semi-finals, and then in the Finals and get within the top three places to "win" that track; the medals are Bronze, Silver and Gold. There are eight tracks to complete. When racing, players must attempt to stay in the lead of their five opponents. In show-off, players are required to perform as many fancy tricks as they can and obtain as many points as they can. If this mode is completed in Race, the extra track "Untracked" is unlocked for Freeplay. Similar to Showoff is Pipedream. Single Event takes, as its name suggests, one of the events over a single heat from World Circuit mode. Medals are awarded at the end of the track, and a second human player can be added. During development, SSX Tricky was referred to using various names, such as SSX 1.5 and SSX CD. The PlayStation 2 version received "universal acclaim", and the GameCube and Xbox versions received "favorable" reviews, while the Game Boy Advance version received "average" reviews according to video game review aggregator Metacritic. Most reviews hesitated before calling the game a "true sequel" since it shared a large amount of content with the original SSX (all but two of the courses appear in the original). Reviews did compliment the added features, such as "Uber tricks" and "Rivalry" with other boarders. Some reviewers thought that the improvements over the original were so good that SSX Tricky was billed as the best snowboarding game to date. The voice acting was highly praised by many reviewers, noting that the use of celebrities such as Lucy Liu helped bring the outrageous characters to life. The music system received much acclaim as it was able to adapt to suit the situation. Each course had specific songs paired with it to match the mood and when riders reached maximum boost or were knocked down, the music reacts. The size of the environments, the detail of the graphics and the trick system also received plenty of recognition from reviewers. In Japan, Famitsu gave it a score of 32 out of 40 for the GameCube version, 30 out of 40 for the PS2 version, and three sevens and one eight (29/40) for the Xbox version. In predicting the sales for the game, PSX Extreme said "It's quite unfortunate if I do say so myself, because a AAA title like SSX Tricky won't be getting the sales it really deserves." IGN called it the 95th best PlayStation 2 game. The staff cited its improvements over its predecessor (which includes "flashier Uber moves"). ^ Perry, Douglass C. (17 October 2003). "SSX 3 (Xbox)". IGN. Ziff Davis. Retrieved 2 March 2015. ^ Marriott, Scott Alan. "SSX Tricky (GBA) - Review". AllGame. Archived from the original on 15 November 2014. Retrieved 3 September 2015. ^ Holoka, Chris. "SSX Tricky (GC) - Review". AllGame. Archived from the original on 15 November 2014. Retrieved 3 September 2015. ^ Thompson, Jon. "SSX Tricky (PS2) - Review". AllGame. Archived from the original on 15 November 2014. Retrieved 3 September 2015. ^ Edge staff (January 2002). "SSX Tricky (PS2)". Edge. No. 106. ^ EGM staff (January 2002). "SSX Tricky (PS2)". Electronic Gaming Monthly. No. 150. p. 222. ^ Bramwell, Tom (4 December 2001). "SSX Tricky (PS2)". Eurogamer. Retrieved 4 September 2015. ^ Bramwell, Tom (4 July 2002). "SSX Tricky (Xbox)". Eurogamer. Retrieved 4 September 2015. ^ Reiner, Andrew (December 2002). "SSX Tricky (GBA)". Game Informer (116): 152. Archived from the original on 27 February 2005. Retrieved 3 September 2015. ^ Reiner, Andrew (February 2002). "SSX Tricky (GC)". Game Informer. No. 106. p. 87. Archived from the original on 27 August 2004. Retrieved 3 September 2015. ^ Reiner, Andrew (December 2001). 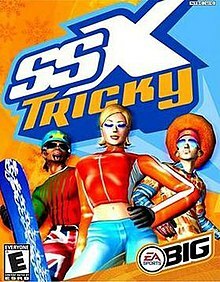 "SSX Tricky (PS2)". Game Informer. No. 104. p. 92. Archived from the original on 13 November 2004. Retrieved 3 September 2015. ^ Reiner, Andrew (February 2002). "SSX Tricky (Xbox)". Game Informer. No. 106. p. 92. Archived from the original on 15 November 2004. Retrieved 3 September 2015. ^ Vicious Sid (14 October 2002). "SSX Tricky Review for Game Boy Advance on GamePro.com". GamePro. Archived from the original on 18 January 2005. Retrieved 4 September 2015. ^ Dan Elektro (27 November 2001). "SSX Tricky Review for GameGube on GamePro.com". GamePro. Archived from the original on 6 February 2005. Retrieved 4 September 2015. ^ Tokyo Drifter (5 November 2001). "SSX Tricky Review for PS2 on GamePro.com". GamePro. Archived from the original on 4 February 2005. Retrieved 4 September 2015. ^ Tokyo Drifter (11 January 2002). "SSX Tricky Review for Xbox on GamePro.com". GamePro. Archived from the original on 14 February 2005. Retrieved 4 September 2015. ^ Dr. Moo (December 2001). "SSX Tricky Review (GC)". Game Revolution. Archived from the original on 27 February 2015. Retrieved 4 September 2015. ^ Dr. Moo (November 2001). "SSX Tricky - PS2". Game Revolution. Archived from the original on 9 July 2008. Retrieved 4 September 2015. ^ Dr. Moo (December 2001). "SSX Tricky - Xbox". Game Revolution. Archived from the original on 18 July 2008. Retrieved 4 September 2015. ^ Provo, Frank (5 December 2002). "SSX Tricky Review (GBA)". GameSpot. Retrieved 3 September 2015. ^ Satterfield, Shane (5 December 2001). "SSX Tricky Review (GC)". GameSpot. Retrieved 3 September 2015. ^ a b c Satterfield, Shane (7 November 2001). "SSX Tricky Review (PS2)". GameSpot. Retrieved 3 September 2015. ^ Satterfield, Shane (17 December 2001). "SSX Tricky Review (Xbox)". GameSpot. Retrieved 3 September 2015. ^ Cassady, David; McBride, Debra (6 March 2002). "SSX Tricky (GameCube)". GameSpy. Archived from the original on 23 February 2005. Retrieved 3 September 2015. ^ a b c Moen, Michael G. (15 November 2001). "GameSpy: SSX Tricky (PS2)". GameSpy. Retrieved 3 September 2015. ^ Bub, Andrew S. (15 December 2001). "GameSpy: SSX Tricky (Xbox)". GameSpy. Retrieved 3 September 2015. ^ Bedigian, Louis (1 January 2002). "SSX Tricky - GC - Review". GameZone. Archived from the original on 21 March 2009. Retrieved 4 September 2015. ^ Krause, Kevin (22 November 2001). "SSX Tricky - PS2 - Review". GameZone. Archived from the original on 4 October 2008. Retrieved 4 September 2015. ^ Harris, Craig (13 November 2002). "SSX Tricky (GBA)". IGN. Retrieved 3 September 2015. ^ Casamassina, Matt (29 November 2001). "SSX Tricky (GCN)". IGN. Retrieved 3 September 2015. ^ Smith, David (6 November 2001). "SSX Tricky (PS2)". IGN. Retrieved 3 September 2015. ^ a b Boulding, Aaron (10 December 2001). "SSX Tricky (Xbox)". IGN. Retrieved 3 September 2015. ^ "SSX Tricky (GBA)". Nintendo Power. Vol. 164. January 2003. p. 178. ^ "SSX Tricky (GC)". Nintendo Power. Vol. 151. December 2001. p. 168. ^ "SSX Tricky". Official U.S. PlayStation Magazine. January 2002. p. 140. ^ "SSX Tricky". Official Xbox Magazine. March 2002. p. 68. ^ "SSX Tricky (PS2)". FHM. 2 December 2001. Archived from the original on 23 June 2002. Retrieved 3 September 2015. ^ a b "SSX Tricky for Game Boy Advance Reviews". Metacritic. Retrieved 23 March 2012. ^ a b "SSX Tricky for GameCube Reviews". Metacritic. Retrieved 23 March 2012. ^ a b "SSX Tricky for PlayStation 2 Reviews". Metacritic. Retrieved 23 March 2012. ^ a b "SSX Tricky for Xbox Reviews". Metacritic. Retrieved 23 March 2012. ^ "ニンテンドーゲームキューブ - SSXトリッキー". Famitsu. Vol. 915. 30 June 2006. p. 97. ^ "プレイステーション2 - SSXトリッキー". Famitsu. Vol. 915. 30 June 2006. p. 91. ^ Gantayat, Anoop (29 March 2002). "Japan: Week in Review". IGN. Retrieved 5 July 2017. ^ Katayev, Arnold (17 November 2001). "SSX: Tricky Review". PSX Extreme. Retrieved 29 October 2014. ^ "SSX Tricky - #95 Top PS2 Games". IGN. Retrieved 6 December 2013.